The nuts and bolts of pumping and storing breast milk. When Jo Anderson became pregnant, she knew she wanted to breastfeed her baby for as long as possible, even after she went back to work. But when she returned to her job as a public relations executive, she found that continuing to breastfeed was more difficult than she had anticipated. "Finding the time to pump was hard," says the 37-year-old Anderson. "Even though my employer was understanding and supportive, my job is pretty demanding, and it was tough to get away from my desk three times a day for the 20 or so minutes it took to pump." But the work didn't end there. "When I got home at the end of the day," Anderson says, "the last thing I wanted to do was wash and sterilize the pump and bottles and then get my milk ready for the next day." Yes, continuing to breastfeed once you've returned to work takes commitment, but it's well worth the effort. Not only does it allow you to meet your baby's nutritional needs in the best possible way, but it also helps make long separations more bearable by knowing that you're giving him a special gift several times a day — even when you're far away from him. "Sure, pumping was inconvenient at times," Anderson says, "but I wouldn't have done it any other way." 1. I really want to continue to breastfeed once I return to work, but my friends tell me it's not worth the hassle. And won't people in my office be resentful? Continuing to breastfeed once you've returned to work can add time and work to your day, but the health benefits for your baby — fewer ear infections and respiratory illnesses to name just two — are endless. "Breastfed babies are much less likely to get sick during their first year than formula-fed babies," says Marsha Walker, R.N., I.B.C.L.C., a lactation consultant in Weston, Mass., and former president of the International Lactation Consultant Association. Furthermore, Walker adds, since their babies are sick less often, breastfeeding mothers who work have three to six times less absenteeism than those who exclusively formula-feed their babies. And that's good for everyone in the office. 2. I know I need a good breast pump. Should I buy or rent one? For the first 10 days to three weeks after your baby is born, your life will revolve around nursing. "This is the crucial time for establishing an adequate milk supply," Walker says. For this reason, breastfeeding experts recommend against using pacifiers, bottles or formula until breastfeeding is going smoothly for you and your baby. After those first two to three weeks, try to start pumping after each feeding; if it's too difficult to pump this often, aim to do it daily after the first morning feeding. You can either store your milk in the freezer for when you return to work or, when your baby is a bit older, you can let your partner or other family members share in the joy of feeding by giving the baby breast milk from a bottle. 4. Wait a minute — won't giving my baby a bottle confuse him or interfere with breastfeeding? Since many babies will not accept a bottle from Mom, this is a perfect opportunity to get your partner or other family members in on the act. The first few times you do offer a bottle, don't wait until your baby is frantically hungry. Also, be prepared to leave the room (or even the house); if the baby sees you, he may want your breast rather than the bottle. 5. How much milk do I need to have on hand when I go back to work? Some experts say that a month's worth is ideal (if this isn't possible, aim to store at least a week's worth), so the sooner you start pumping and building up your stores, the better. Remember that you will bring home fresh milk every day, so what's in the freezer can be considered the emergency or backup supply (you occasionally may not be able to pump as much milk as your baby takes in a feeding; you can make up the difference with the milk you've stored). Also, be sure to keep a few "emergency" cans of formula on hand in case your supply of breast milk dwindles. 6. When is the best time to pump once I return to work? Ideally, you should pump during the times when your baby would normally nurse. But if you can't match your pumping schedule to his feeding schedule, don't worry; pump during your breaks and lunch hour, and you'll be in good shape. Don't be discouraged if you don't get as much milk from the pump as you'd hoped or if, on some days, you have time to pump only once or twice. You can always make up the difference by pumping in the evenings and on weekends. Also remember that your baby may adapt his feeding schedule to accommodate yours; some babies start to nurse more often or for longer in the mornings and evenings because they want the extra bonding time with Mom. And as long as your baby is growing and has two to five bowel movements and six to eight wet diapers a day for the first two months of life, this "reverse" feeding system can work. 7. 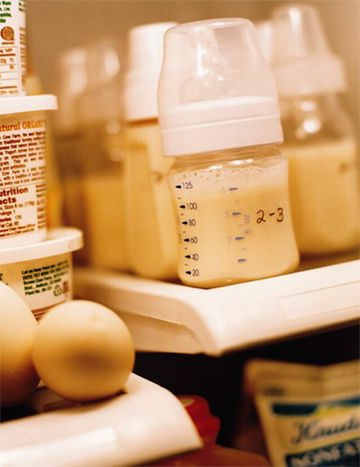 How do I safely store my expressed breast milk? 8. How do I get my milk home? Breast milk can be safely kept at room temperature for four to six hours without danger of bacteria growth. But to be on the safe side, put your milk in a refrigerator or insulated cooler with ice packs until you head home. Then, before you put the milk in the freezer, separate it into 2- or 3-ounce servings so you don't waste any of your hard-earned "liquid gold." 9. How do I thaw my milk? Hold the sealed bottle or bag under running hot water or place it in a bowl of hot water. Never heat breast milk in a pot of boiling water or in a microwave oven; this will destroy some of the milk's beneficial properties and can lead to uneven heating and the risk of burning your baby's mouth. After the milk is heated, shake it well (it's normal for the milk to separate into cream and milk layers) and then test its temperature. For details about your legal rights as they pertain to breastfeeding, visit www.lalecheleague.org or call 800-LALECHE.